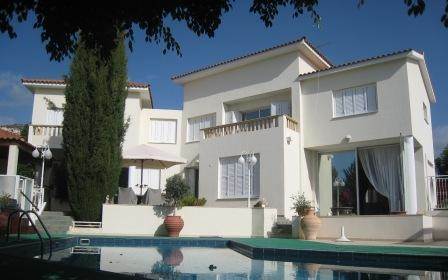 Valued at 1,400,000 Euros + Title Deed NOW SOLD! 750 s. m., 6 bath, 5 bdrm 2 story - €795,000 EUR - NOW SOLD! 2 Cars come with the sale! This property also comes fully furnished with all linens, white goods and tools. This Peyia Villa is priced to sell! In addition to all the wonderful features this custom built home offers, the owner is including 2 almost new cars with the sale (details are below)! The luxury and spacious villa is situated near the village above a ravine overlooking western Peyia and the Mediterranean Sea. A perfect large family home that would be perfect for entertaining. A masterpiece of practicality in the layout. Also on the property is a fully equiped and seperate one bedroom villa. It has also been passed by the authorities for use as an offshore office. The home features a high-ceiling with an artistic design, a spacious living room with built in cinema. One step down is an adjoinng lounge area with a decorative round windowwith built in bookshelves, wall and large full-wall size double glass doors that open up onto the pool area. Take a step up to the open dining room that leads directly to the kitchen. There is a large double size sliding door out of the dining room to the outside kitchen bar and pool area. The dining room has a door to the utility room that leads to the garage. There is also a large bedroom with ensuite on the ground floor. Upstairs is a large mezzanine with sitting area that features a built-in book case and a balcony with views of the sea. There is an upstairs room with bay window that is used as a kitchen. There are also 4 bedrooms, 3 have ensuite bathrooms, one being a wet room. Outside is a large tiled swimming pool, pergola, jaccuzi, a decorative waterfall, kitchen, private laundry area and a seperate maids or guest bungalow.